Technology is augmenting customer standards at a breakneck speed. For automotive retailers, there is an increased focus on functioning beyond the expected service, to provide a distinguishing customer experience. The transformation that the automotive industry is undergoing will, in turn, have impacts on the entire customer experience and the value chain. While automotive retailers have to maintain to acquire, retain and maintain loyal customers in their traditional business, they are considering new emerging business models. 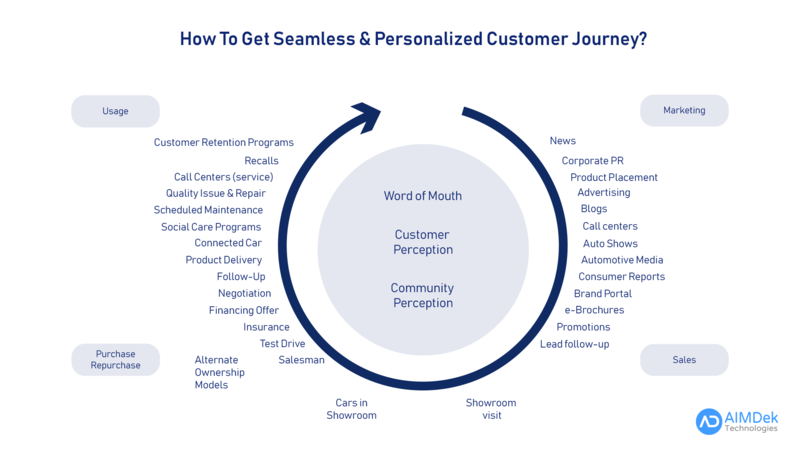 How Salesforce transforms customer journey? The present-day shoppers and owners have higher expectations for every brand they interact with. They expect a personalized and seamless experience through every phase of the customer life cycle. Salesforce assists you to hear your customers out and engage them at each touch-point, comprising of online, social media, mobile devices, showrooms and upcoming connected cars. The key to accelerating innovation is by creating personalized journeys to build customer loyalty. Salesforce provides functionalities to support an omnichannel offering made available with a push of the button accessed via your brand’s mobile apps and now available on the dashboard in app-enabled vehicles. Salesforce makes the future look exciting as the platform shifts from just offers and deals to increased interactions and transactions with customers. How does Salesforce help convert more leads? Salesforce helps you capture and direct leads from any channel and handle the relationship from the hand-raiser to test drive to sale with profound insights. Salesforce CRM empowers automotive retailers with the convenience of a unified view of the customer that caters to the holistic view of the data so that everyone can see everything they need to know about the customer. This helps move deals faster, prioritize and make quick decisions based on the updated information from any device. Salesforce thus assists in nurturing the leads so they are ready to convert and then consequentially route them to the right sales representatives at the right time. How Salesforce connects and engages customers at every channel? Today’s ever more connected customers live in an instant, mobile, web-driven world where only personalization rules. Customers expect brands to be there at every phase of their vehicle ownership. Thus, they expect uninterrupted, one-to-one service on the channel of their choice, anywhere, every time. 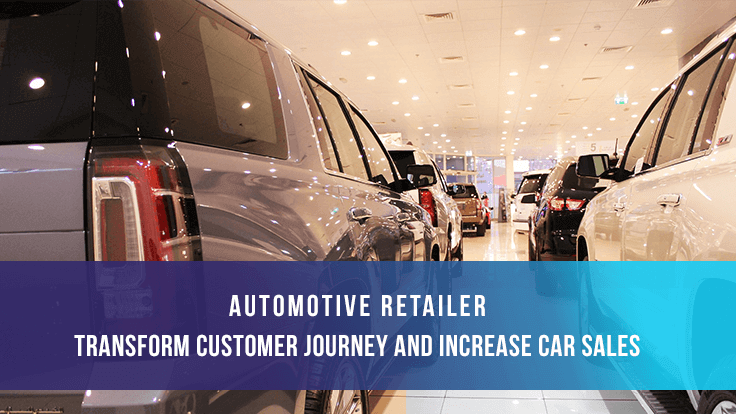 Salesforce assists automotive retailers to craft more personalized and connected experiences helping them sell better, service better and keep the relationship strong. Salesforce empowers automotive retailers to access all of their customer data and put it all into action instantaneously. Salesforce helps them create a 360-degree view of every customer and send them personalized messages across each interaction in any phase of the customer lifecycle. Besides this, Salesforce also helps inspire customer engagement at every touchpoint and craft seamless relationships with your customers regardless of how they are communicating with your brand. Salesforce also enables you to quickly integrate features like live chat, video chat, in-app messaging, knowledge articles and more to your native mobile apps. This empowers automotive retailers to cater branded, best-in-class service experiences anywhere and every time your customer needs service. 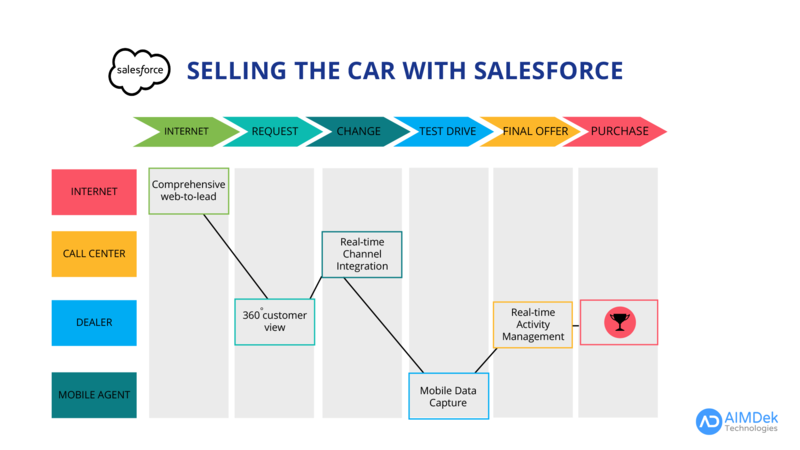 Salesforce helps the automotive industry to break through any barrier to customer satisfaction. The platform caters intelligence and productivity tools to help automotive dealerships deliver more connected, personalized and proactive customer services across multiple channels and devices. Besides this, Salesforce as an agile and scalable platform adapts effortlessly to growth and evolving business and customer requirements. To cater seamless omnichannel experiences one needs to connect the right information to the right people at the right time. Salesforce just does this. Learn how to stand apart as a great automotive dealership by reaching out to us at marketing@aimdek.com.